The Zeonic Geofront: Akibamerica Update! Hey all! I thought it was about time I come and pimp my other blog: Akibamerica. 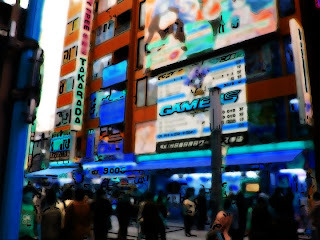 Akibamerica focuses on recommendations and reviews of video games and animation from Japan. The SNK Challenge - I took a month to play through nearly ALL of SNK's fighting games, as well as many of their other arcade offerings. I covered some series specifically: Fatal Fury, King of Fighters, and Art of Fighting. Evangelion Pachinko Machines -these little beauties are all over Tokyo and I relate my personal experience with one. Tsukihime - And now my newest endeavor is to make it through every storyline in Tsukihime, the precursor to Fate/Stay Night, as well as all the sequels and the Melty blood series. Wish me luck!